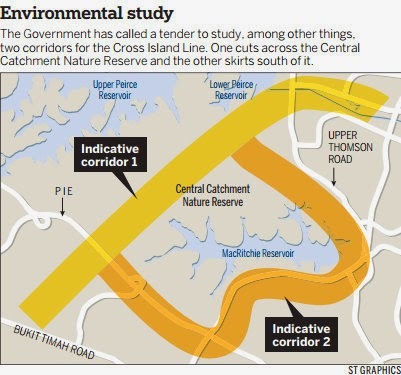 Nature groups have submitted their ecological study of the Central Catchment Nature Reserve to the Land Transport Authority (LTA). LTA will use the study as a reference for consultants conducting the Environmental Impact Assessment (EIA) for the Cross Island MRT Line. 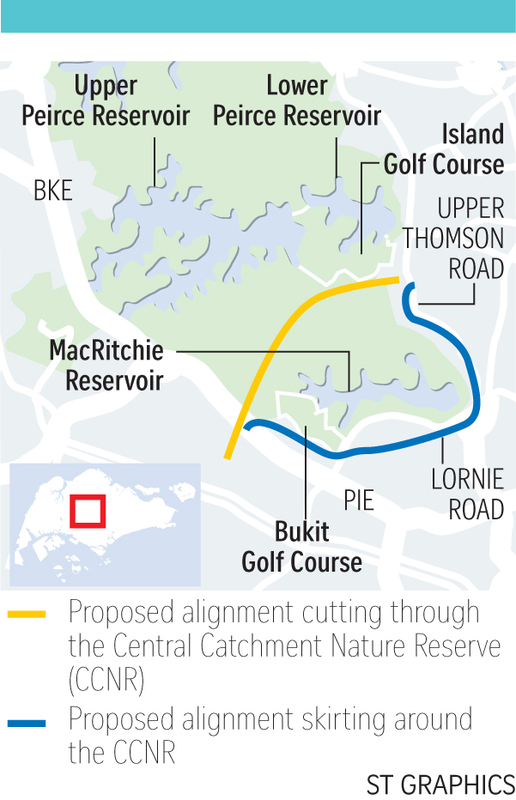 The EIA will help LTA decide if the MRT line should pass through the nature reserve or skirt around it. Spanning almost the entire length of Singapore, the 50-kilometre Cross Island Line was announced in January, 2013 and is slated for completion in 2030. The nature groups, which spent about three months collating available literature and research from the past 20 years on Singapore's largest nature reserve, are calling for the protection of the forest area and are concerned about the possibility of the Line being built through it. The study was done by seven environmentalists, some of whom are members of the Nature Society (Singapore), the Singapore Environment Council, and Cicada Tree Eco-Place. The result is a 120-page document describing the extent of biodiversity in the reserve located in the central part of Singapore. The document has recorded about 400 species of trees, 200 species of birds, 400 species of insects and 150 species of mammals and amphibians. The groups want to provide a realistic assessment of the impact of any physical works in the forests. They say the study will save the environmental consultants working on the EIA a lot of ground work. “I think the agency has done a fairly good job of putting together the tender document, and the requirements that are in there, and we can expect some very high quality EIA consultants to tender for this project." An expert familiar with EIA matters says the consultants will need to have diverse expertise. "In addition to the technical aspects of engineering, the team should include at least some members who have environmental expertise -- particularly in botany, the soil sciences, how it affects the plants, vegetation, the trees etc., to review the report,” said Prof Leung Chun Fai from the Department of Civil & Environmental Engineering at the National University Of Singapore. With the study in hand, nature groups hope to convince the consultants and authorities to preserve the Central Catchment Nature Reserve. "The nature reserve is like the green heart in the red dot, and every time there is a project around the edge and through the nature reserve, it takes a small bite out of the apple,” said O’Dempsey. “And if you take lots of small bites you are going to consume the whole apple after a while." The LTA said the nature groups' study together with the earlier position paper by the Nature Society (Singapore) will be incorporated into the EIA tender. They will also serve as useful resources for the EIA consultant in studying how the various alignment options could affect the nature reserve. LTA is expected to call the EIA tender by next month. The assessment is expected to be completed in 2016, and this will be followed by an 18-month engineering feasibility study on the possible routes. Post by Land Transport Authority – We Keep Your World Moving. Tests to see how a train tunnel through Singapore's largest and most important nature reserve can be built have been slated for the third quarter. The impact on the animals and plants around the test sites can be kept to "moderate" levels, said the Land Transport Authority (LTA) yesterday without going into detail, citing the findings of an independent environmental study. The study suggested several strategies to mitigate the impact to flora and fauna, including the use of enclosures to reduce engine noise, and tanks to collect discharge. Still, nature groups told The Straits Times that "mitigation does not equal no impact". The 50km Cross Island Line to link Changi and Jurong by 2030 was first announced in early 2013, and preliminary plans showed it cutting through primary and secondary forests in the Central Catchment Nature Reserve near MacRitchie Reservoir. But nature groups, alarmed by the environmental harm which the construction and operation of an underground MRT line right across the heart of the reserve could cause, suggested that the line be built along Lornie Road. This alternate route goes around the reserve. The decision on whether to build through or around the reserve is still being mulled over. But the LTA in 2013 did say that an environmental impact assessment (EIA) of the line on the reserve would be done. The assessment's first phase, which includes looking at the potential impact of site investigation works, was carried out between August 2014 and last December by consultancy Environmental Resources Management. Yesterday, the LTA gazetted the first phase of the EIA. "The report concluded that the proposed site investigation works, with the implementation of mitigating measures and controlled access, could be carried out with moderate impact on the few parts of the nature reserve where these works are to take place," it said. The assessment also suggested alternative methods to collect data, so as to minimise the number of boreholes that need to be drilled within the nature area. Instead of drilling 72 boreholes, each of which is 10cm in diameter and stretches between 50m and 70m underground, only 16 will be needed to assess the soil and rock profile. The authorities will also use non-intrusive methods to find out about the soil and rock at the reserve. In addition, the plan is to drill the boreholes only on public trails and clearings - which means that existing vegetation would not have to be cleared. In comparison, 250 boreholes will be drilled along the alternative route along Lornie Road. Nature groups here welcomed the Government's efforts to check on the environmental impact of an MRT line in the reserve, which comprises pristine freshwater streams and the country's largest patch of primary lowland rainforest. It is also home to at least 413 species of plants, 218 species of birds, 30 mammals, 24 freshwater fish species and 17 species of amphibians. Said Mr Tony O'Dempsey of the Nature Society (Singapore): "Our policy is that nature reserves should not be touched at all, as the impacts are cumulative, but the Nature Society is very happy to be involved in consultations with the authorities. We have some concerns on vibrations, noise and cave-ins, which we will discuss with the authorities during the next phase." Wildlife consultant Subaraj Rajuthurai, who was also involved in the consultations with the authorities, said: "Acceptable impact is zero impact. All the other East-West systems, such as the current East-West MRT line or the Pan Island Expressway, have avoided tunnelling through the nature reserve. "Although most of the work for the MRT line is underground, it could have a massive impact on the nature reserve, which is one of the most important nature areas for Singapore." Phase Two of the EIA, which will be completed by the end of the year, will study and assess the potential environmental impact on the reserve arising from the construction and operation of the Cross Island Line for both routes. The EIA findings will be one of the factors used by the authorities to decide on the final alignment of the Cross Island Line. Other factors include connectivity, travel times, costs and impact on home and other land owners. When queried, Mr Sim Cheng Hai, director of policy and planning at the National Parks Board (NParks), said site investigation works are potentially impactful. He said: "This is why NParks has worked with LTA to mitigate the potential impact of the site investigation on the Central Catchment Nature Reserve, such as reducing the number of boreholes for the Cross Island Line site investigation, defining areas which are off-limits and providing staff to monitor the works in the geophysical survey." Maids: No day off ? No way! Can we do even more for our pioneers? Online vigilantes going too far?